My Company Wants Me To Return to Work After Injury. Now What? Home » The Law & You » My Company Wants Me To Return to Work After Injury. Now What? A viewer broke his arm while at work. Although his arm has yet to heal, his company wants him back to work. Is there anything he can do? 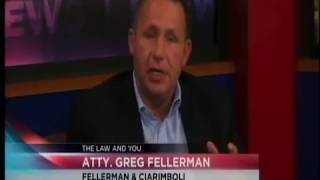 Workers compensation attorneys Greg Fellerman and Ed Ciarimboli explain what should happen next. Dave Kuharchik: What do you do if your company wants to go back to work when you’re injured and you’re not yet healed. We’re going to address that today at “The Law & You.” Joining us today are attorneys, Greg Fellerman and Ed Ciarimboli, thanks for being here today. Greg Fellerman and Ed Ciarimboli: Thanks for having us, Dave. Greg: Well Dave, this is something we see all the time. We see employers and insurance companies trying to force employees back to work before they’re healed. So, right off the bat, you need a lawyer. You need to begin litigating this case to protect your rights. If your arm isn’t better, you need to make sure you are seeing a doctor, treating with that doctor, and getting the documentation to support your claim and your case when you step in court. Ed: Another thing is that they can’t just force you back to work unless a judge agrees with them. However, there are a number of things you’ve got to do to make sure your rights are protected, so when you do go into the courtroom, you’re going to stand a much better chance of being successful in litigating that case. You’re company can’t just make the decision, “Mr.Jones you have to go back into work today,” if you’re not medically ready and if you’re doctors don’t think you’re medically ready to go back into work. As Greg mentioned, you’ve got to pick up the phone, you’ve got to get someone involved who knows this area of the law; It’s a very specific part of the law, it’s very technical, there’s a lot of forms that need to be filled out, and you want to make sure all the ‘T’s are crossed and the ‘I’s are dotted as you move forward on this issue. Dave: I’m sure our viewers have questions in this realm, and if they do, how can they get in touch with you guys? Ed: They can get us at our web-site 714hurt.com or they can call us. Dave: Alright, thanks for being here today.